Blue Spider combines several outstanding qualities into one stellar Sativa-dominant hybrid that will delight cannabis growers and connoisseurs. She blends the potency and great high of the popular White Widow with the taste of Blueberry for a superb fruity aroma with subtle spicy notes. Stable genetics make her easy to grow which make Blue Spider Bulk Seeds an excellent choice also for beginners! The name that we have given our Blue Spider Bulk Seeds isn’t just hinting at one of her parents, the very popular White Widow, but is also meant as a tribute to spiders, critters that are tirelessly helping to keep insects in check and therefore, whether they are aware of it or not, also prove beneficial for our cannabis cultivation endeavours. Blue Spider’s other genetic side comes from an equally famed strain: the fruity-tasting Blueberry. Because of her stellar genetics, Blue Spider is a very stable strain that less experienced growers can grow with the same ease and joy as seasoned cannabis cultivars. You can grow Blue Spider indoors or outdoors although her overall height makes her especially suited for indoor cultivation. She will then reach a convenient height of 80-110cm. Outdoors, however, you can have her grow to a sizeable plant where she can reach up to 230cm in ideal conditions. Her indoors yields are decent with up to 450g/m² while plants grown outdoors can reward you with as much as 550g per plant. Especially noteworthy is Blue Spider’s rather short flowering time that is only 55 days, which means that growers won’t have to wait too long to harvest piles of first-class dank bud. When smoked, Blue Spider delights with the already awesome and unique fruity taste that we know from Blueberry but this time with a hint of spiciness that she got from her White Widow side. With about 18% of THC, she delivers a quite potent smoke that won’t disappoint even some more experienced cannabis enthusiasts. Her effect is uplifting and energising, making for a perfect daytime smoke that can give you a boost of creativity and motivation. A great smoke if you want to turn pretty much any activity into a fun task! Looking at Zambeza’s Blue Spider Bulk Seeds it can be really difficult to find a reason not to grow this excellent Sativa. Stellar genetics, a great taste and superb high make Blue Spider a good choice if you want to grow a truly first-class Sativa. 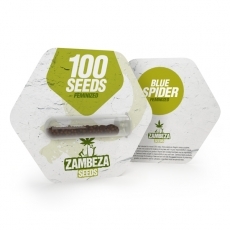 Blue Spider Bulk Seeds by Zambeza are available in economic packs of 100 seeds.